If you’re planning to get out and about on the region’s roads between Monday, September 28th, and Sunday, October 4th, here’s a list of planned and on-going roadworks you’ll need to know about. Highways England has issued the following summary of planned new and ongoing road improvements but stress it could be subject to change due to weather conditions or unforeseen circumstances. “All our improvement work is carried out with the aim of causing as little disruption as possible,” said a spokesman. A major project is taking place to tackle congestion at junction 11 of the M56 near Daresbury. Signed diversions will be in place when roads are closed. A £945,000 scheme to resurface sections of the main carriageway and slip roads around these junctions has begun and will be completed by Tuesday, October 6th. All the work is overnight – between 9pm and 6am – involving single slip road closures (junction 24 slip roads and the junction 25 southbound entry slip road) and lane closures on the main carriageway. Work to resurface sections of the southbound carriageway near Tebay Services started last Monday. Contractors will also install new reflective road studs, replace road markings and carry out repairs to two bridges. Two lanes will be open to traffic during the day, between 6am and 8pm, and one lane overnight, between 8pm and 6am. The project is due to be completed by the end of October. The exit slip roads from the westbound M62 onto the northbound M6, and from the eastbound M62 onto the southbound M6 will be closed overnight, between 8pm and 6am while repair work takes place on motorway bridges. Drivers will be able to follow signed diversion routes. Narrow lanes and a temporary 50mph speed limit will also be in place on the slip roads during the day. 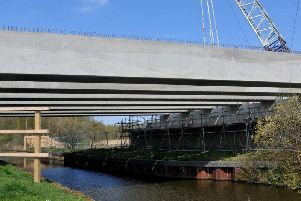 The scheme is due to be completed in December. A £1.7m. project to resurface the main road to the Port of Liverpool started in August. A 2.5 mile stretch of the A5036 is being resurfaced from the junction with the M57 and M58, known as Switch Island, to the junction with Hawthorne Road. All of the work will be carried out overnight to keep disruption to a minimum, and signed diversions will be in place when short stretches of the road are closed. Work has now been largely completed with the junction fully-open to drivers. Some snagging work and installation of street lights remains, which will be carried out using overnight lane closures only. Overnight closures of the A556 in both directions (week nights only) between Bucklow Hill and Bowdon View roundabout up to Friday (October 2nd. Overnight work to resurface parts of the junction between the A585 and Anchorsholme Lane will be taking place between 9pm on Friday, October 2nd, and 6am on Saturday, October 3rd. New road markings will also be provided along with an additional speed limit sign to improve safety. Temporary traffic signals will be in place during the overnight work. Work begins on Monday, September 28th, on an 11 to 12-week scheme to improve drainage and paths along this section of the route. Work will take place around the clock but temporary traffic signals will only be used overnight. The project should be completed before December 18th. Temporary traffic lights are in use on the A590, west of Lindal for maintenance work which should be completed by Monday, September 28th. Work to replace drainage and improve paths started at the beginning of September. between the junction with the A66 at Bridgefoot and further south at Winscales, and is due to be completed by Friday, October 16th. Work will be delivered using off-peak traffic signals between 9.30am and 3.30pm and 8pm and 6am each day.